This pairing of a black blazer and AG Jeans leather effect skinny jeans from farfetch.com is simple, absolutely chic and very easy to copy! Bump up the cool of your look by completing it with brown leather tassel loafers. If you're in search of a casual yet chic look, pair a grey coat with black leather skinny jeans. Both pieces are totally comfy and will look fabulous paired together. A pair of white low top sneakers will be a stylish addition to your ensemble. If you're hunting for a casual yet totally chic ensemble, consider pairing a white crew-neck t-shirt with AG Jeans leather effect skinny jeans. Both items are totally comfy and will look fabulous paired together. To add oomph to your look, round off with red pumps. If you're on the hunt for a casual yet stylish look, marry a red suede biker jacket with AG Jeans leather effect skinny jeans. Both garments are totally comfy and will look fabulous paired together. Black low top sneakers will deliver more playfulness to your ensemble. 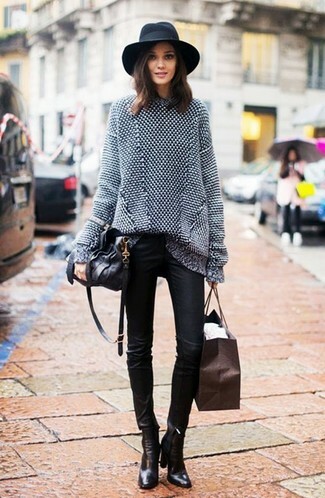 A grey oversized sweater and AG Jeans leather effect skinny jeans is a nice pairing to add to your casual repertoire. Rock a pair of black leather ankle boots to va-va-voom your outfit. If you like a more relaxed approach to style, why not consider pairing a black studded leather biker jacket with AG Jeans leather effect skinny jeans from farfetch.com? As for the shoes, grab a pair of tan nubuck lace-up flat boots. This pairing of a black blazer and AG Jeans leather effect skinny jeans exudes comfort and practicality and allows you to keep it clean yet contemporary. Got bored with this look? Enter beige leopard suede loafers to spice things up. If you're searching for a casual yet chic outfit, marry a white sleeveless blazer with AG Jeans leather effect skinny jeans from farfetch.com. Both pieces are totally comfy and will look fabulous together. Grab a pair of black leather pumps to take things up a notch. If you're on the hunt for a casual yet stylish ensemble, consider wearing a black cape coat and AG Jeans leather effect skinny jeans. Both pieces are totally comfy and will look fabulous paired together. When it comes to footwear, this look pairs nicely with beige suede ankle boots.